[SOLVED] OPNsense +Nvidia Shield +PLEX oh my! Anyone here have an Nvidia Shield that they have PLEX working on? I have PLEX server working on my PC (after entering a NAT Port forward) but when I put it up on Nvidia Shield it can't be found by anything on the network the outside world. I even enabled UPNP to no avail. Re: OPNsense +Nvidia Shield +PLEX oh my! are you seeing the server accessible via the Remote Connect? It sounds like if you are not seeing it, there is something not working with your port forward on 32400. I can connect to it on the local network but it's not available remotely. The port forward works just fine if I fire up the PLEX server running on my PC (that server is visible remotely) so I don't know why it would work for one device and not another (I have a flat network no vlans ATM). I have a few things I do for local plex access. 1 - I make sure the port is showing up properly externally. 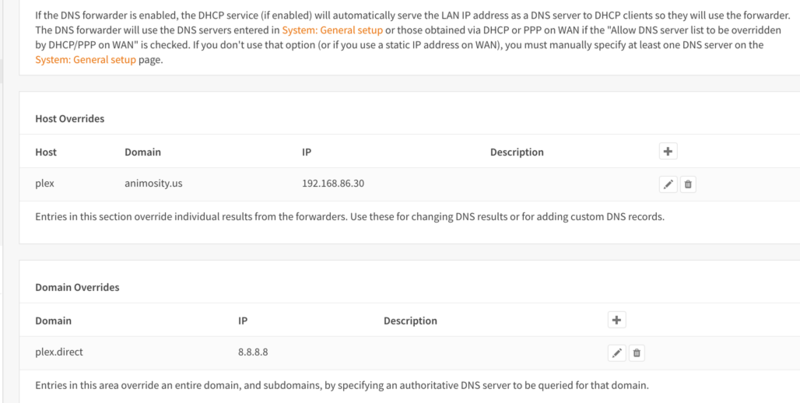 4 - My DHCP clients use my router as the DNS server. My plex server is my case is called "plex" for a hostname as well (I know very unique). Thanks for the info I'll try this tomorrow as it's been a crazy day today and I have to spend some wife time. I'll post back. But step #1 is where I'm dying as my port looks good locally but not available to the internet (remote), and I'm not sure how to do #2. I know with pfSense port forwarding needs a NAT and a Rule is that true with OPNsense too? Yes, it requires a rule and a NAT, but it should auto create the rule for you. The split DNS is underneath the Services->DNS Forwarder at the bottom. I gave you the screenshot of my setup so you can see it in the previous post. Ok so someone on the Plex forums asked me to turn off Reflections for 1:1. I did that and after a few minutes bam! It's all green and up. I'll feel better once this is up and running just fine for a few days but wow I'm a happy camper! I even got my Cujo in line with OPNsense and it's working just fine too! I think I'm going to hit the sack riding on a high! Again thank you for all your help, without your clear instructions I would not have gotten this done. [SOLVED] Re: OPNsense +Nvidia Shield +PLEX oh my! Still up and running and I was able to access the server remotely from work (which is typically the bane for remote access it's locked down tight) so I'm going to put this as solved. I'm going to put together some notes so I don't have to re-invent the wheel. Re: [SOLVED] OPNsense +Nvidia Shield +PLEX oh my! my Cujo started blocking all sorts of connection attempts to port 443 so I tested disabling that rule and the PLEX server did not drop (even after disabling remote access, rebooting everything, etc...). Ok so someone on the Plex forums asked me to turn off Reflections for 1:1.
hi all! I have the same problem, could you explain how to "turn off Reflections for 1:1." did it, but there is no way to solve. I see the green for half a second and then red again.